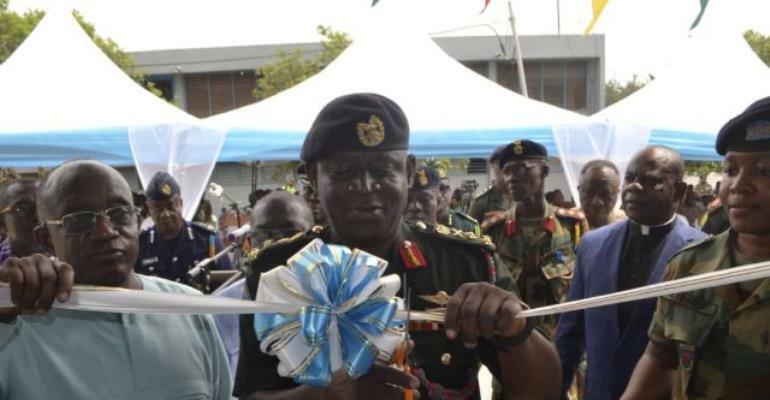 Lt Gen O.B Akwa assisted by Ashanti Regional Minister, Simon Osei-Mensah, formally opened the hall. The unit named the hall in honour of Lt. Gen OB Akwa for his illustrious career worthy of emulation. 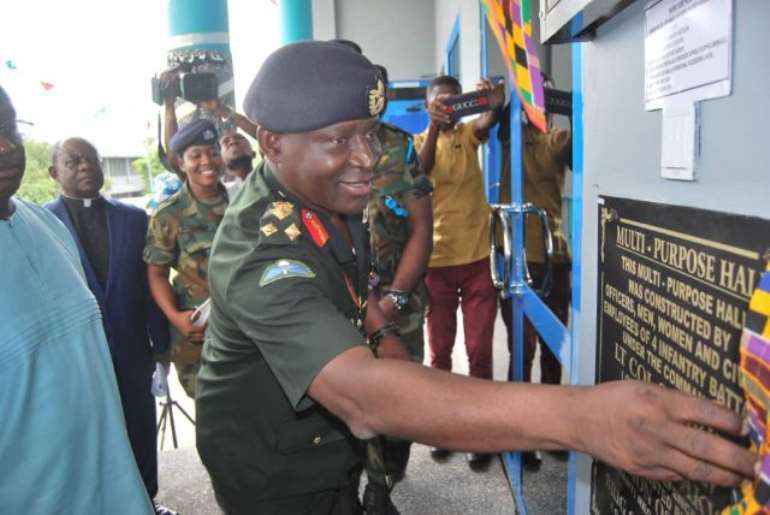 It is believed naming the hall after the CDS will serve as an inspiration to both current and future officers and men of the Ghana Armed Forces. The act is also in recognition and appreciation of the CDS’ unwavering faith and support for the unit. 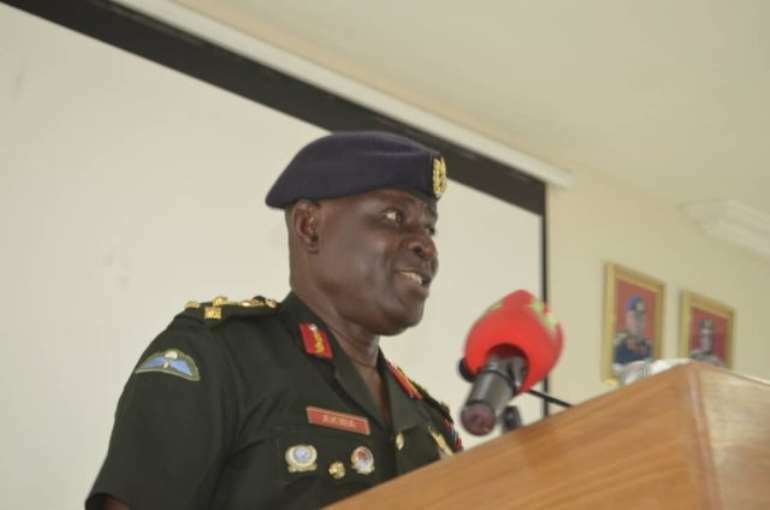 The Commanding Officer (CO) of 4Bn, Lt Col Sebastian Abraham Arhin in his welcome address disclosed that, since assumption of office, the unit has undertaken lots of developmental projects to improve the welfare of personnel and the unit as a whole with the Multipurpose Hall being the flagship project. Some of the projects include a new Conference Hall for briefings, Civilian Employees Office Complex, Reception Hall for visitors, Sachet Water Production Factory and a Barbering Shop. He expressed profound gratitude to the past Commanding Officers who laid the foundation for him to continue with these projects. He added that the completion of the hall is really a dream come true for personnel of the unit since it is going to ease them of the inconveniences they had to deal with using the old hall for lectures, durbars and other social gatherings. The CDS in his speech expressed his appreciation to the CO for the honour done him and lauded the cordial relations that exist between the political authority and the military establishment in the region. 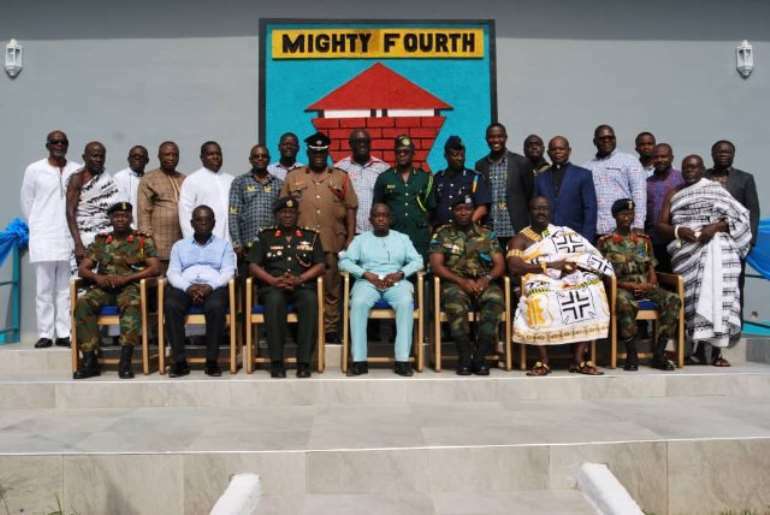 He stated that, Ashanti region is strategically located and is unique to the country in many respects and by extension, so is 4 Bn which is charged with the responsibility of assisting the civil powers to ensure security. He expressed delight in the generous support of individuals and organizations both financially and materially to make the project possible, which he said is a strong indication of positive relationship that exists between the unit and its civilian counterparts. Lt Gen Akwa made a passionate appeal to the unit to continue to nurture and grow the cooperative relationship which he said is good for national development. The Chief of the Defense Staff commended the families of personnel for their total support which he said is having a positive impact on the unit administration and morale. The Ashanti Regional Minister, Simon Osei-Mensah, the Kwadaso Municipal Chief Executive Officer, Richard Agyenim Boateng, Regional heads of the security services, Ex-servicemen of the unit and other guests were present to grace the ceremony.